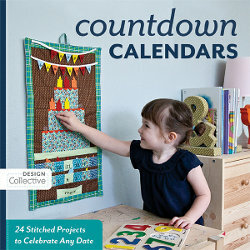 Today’s post is brought to you by the talented Benetta Strydom for favecrafts.com! 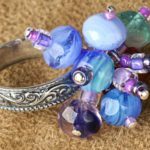 This glorious, vintage craft is bursting with stunning, bright colors that will look absolutely awesome spread out on your table. 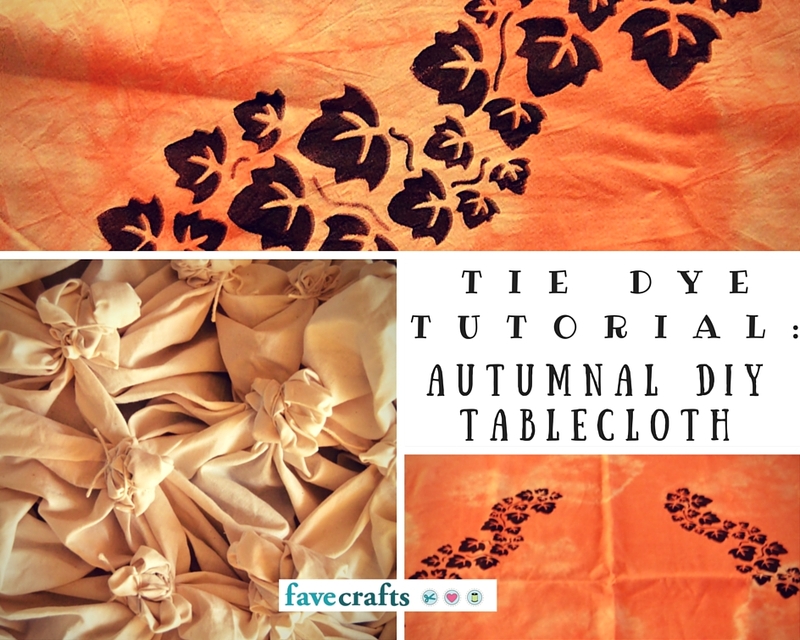 You’ll love this DIY tablecloth that will get you ready for fall in style. It doesn’t get much groovier than this tie dye tablecloth. Personally, I think tie dye is one of the coolest ways to craft, and I wish I did it more often. 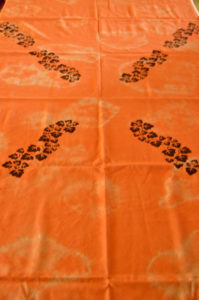 Fall is my favorite time of year, so this tablecloth design automatically has a special place in my heart. Wash the linen and rinse it thoroughly in cold water to remove any sizing agent from the material. Note: Do not add fabric softener when rinsing the linen. 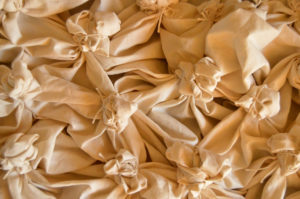 Allow the linen to dry and iron it thoroughly before continuing with the next step. Cut off the linen’s selvage, and sew a double fold hem all around the linen. This will prevent the table cloth from fraying. Iron the hem of the table cloth before preparing the table cloth for tie dying. Lay the table cloth out flat on a surface. Pinch a section of the table cloth between your fingers. Poke it up and tightly tie the string around the bottom of the pinched section. 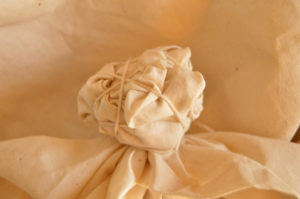 Then tie string all over the pinched section in a random manner and make a secure knot to keep it in place. For this project, it is better to use thin string to create a softer background for the stenciling. Repeat until the whole table cloth has been pinched and tied with string. Now you are ready to color the table cloth! 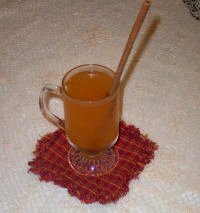 Dissolve the orange dye powder and two cups of salt in a liter of boiling water. to completely cover the table cloth. For a deeper orange, you might need two bottles of dye powder. Bring the colored water to a boil. Wet the table cloth in cold water, and then add it to the pot with the boiling dye solution. Keep boiling the pot on the stove for 30 minutes. 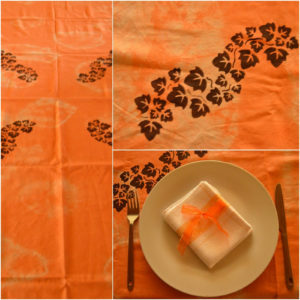 Stir the pot regularly to make sure that the table cloth gets dyed on all sides. Note: Wear rubber gloves when following this step. Take the table cloth out of the pot and rinse it in your sink with cold water to remove any excess dye. 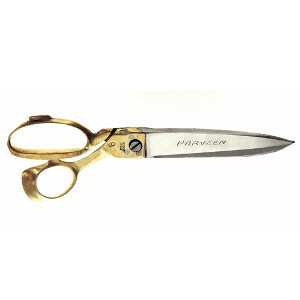 Keep rinsing until the water is clean and then gently cut off the strings. 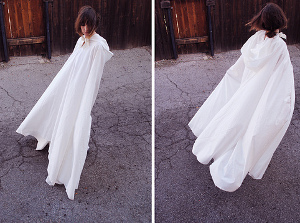 Hang the table cloth in a shady area, or toss it into the tumble dryer. Iron the table cloth thoroughly before continuing with the next step. It will require a lot of ironing to get rid of all the creases. Cover the working surface with an old sheet and then put the table cloth flat on the working surface. Divide the table cloth in four equal parts. Measure the length of the stencil design and use the dressmaker’s pencil to mark where the stencil should be placed. Position the stencil on the table cloth. Note: Use a few heavy objects to keep the stencil in place while painting. 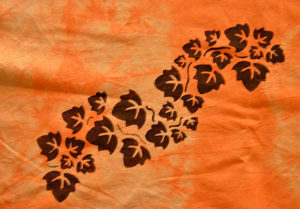 Use the burnt soil fabric paint and a sponge to add the first vine leaves to the table cloth. Carefully lift the stencil and move it to the next position. Weigh the stencil down again before adding another set of vine leaves with the paint and the sponge. Keep adding vine leaves in the same manner. In total, the design was repeated twelve times, 3 times in each quarter. Use a new sponge if the previous one becomes too dirty. Don’t stop there. 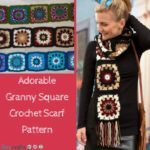 You’re also going to love 100+ Tie Dye Patterns and Techniques. Thanksgiving day can be daunting. There is food to prepare, people to greet, and decorations to make. 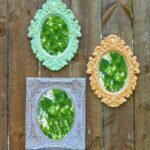 When you start working on your table decor, why not try something new? 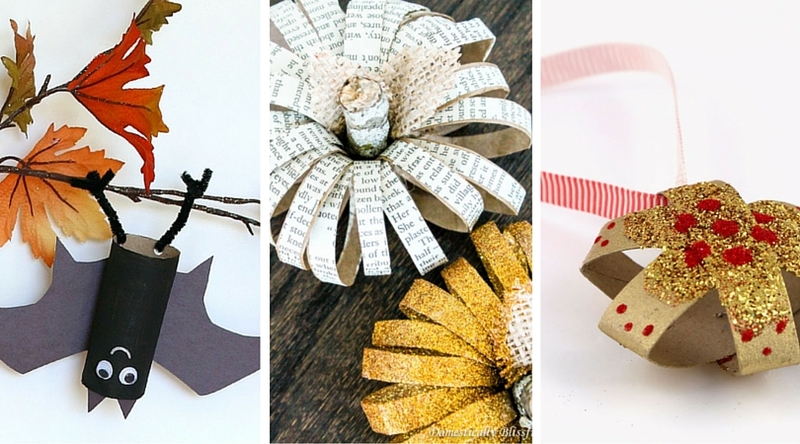 Step out of the box this year and leave those typical turkey decorations behind. 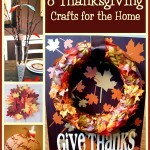 This year, AllFreeHolidayCrafts will help you save your guests from the same old, tired turkey decor. With leafy table runners, creative place cards, and decorative napkins each place setting will be a work of art. 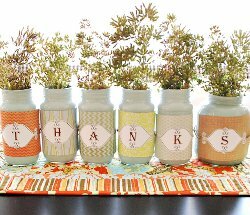 You can also create things like these Give Thanks Jars with recycled jars, or everyone’s favorite: mason jars. 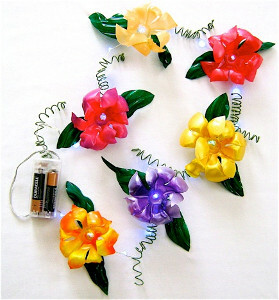 They make a great table centerpiece and will complement the rest of your table decor. These table runners will make you wish that you had these decorating ideas last year. I can already hear the “oohs” and “aahs” as everyone gathers around your dining room table. 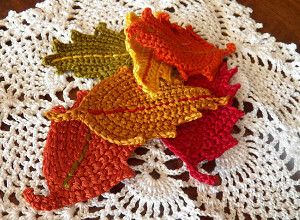 These Thanksgiving table runners are a great alternative to your regular table decor because they bring a fall feel. 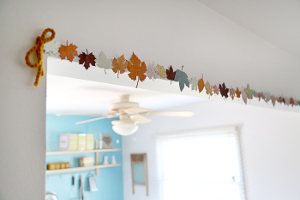 Your home will be warmed by these fun leaf patterns. 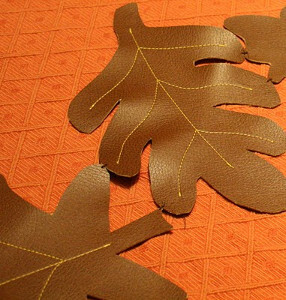 The “Faux Leather Leaves” table runner is a personal favorite of mine because of the textured look it brings to the table. 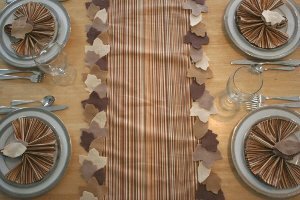 For more table runner tips check out the Simple Fall Leaf Table Runner and Thanksgiving Word Art Table Runner. No table is complete without napkins, and no napkin is complete without a napkin ring. 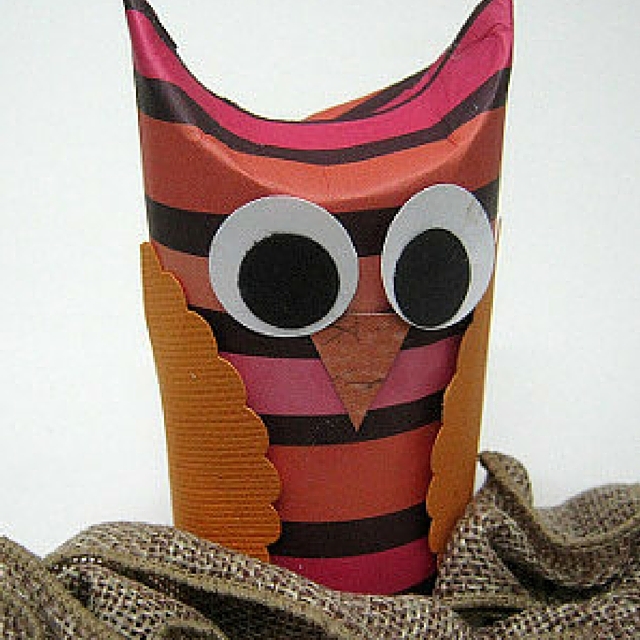 For this Thanksgiving, dress up your usual napkins with these fall crafts. The Burst of Autumn Napkin Rings are a pretty accent to your already decked-out table. 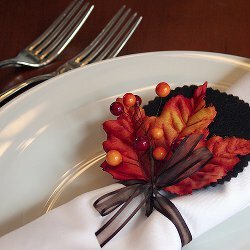 I promise that the preserved leaves on these napkin rings will outshine any turkey-themed table decor. Continue decorating with what looks like a designer napkin, the Fall Dinner Napkins and the Decorative Napkin Rings will accent theme perfectly. 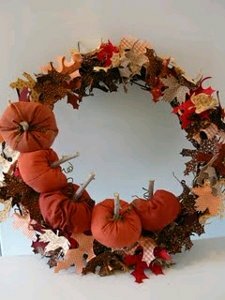 Your table is nearly complete with all of these fall decorations. Now you are merely missing place cards or tags. 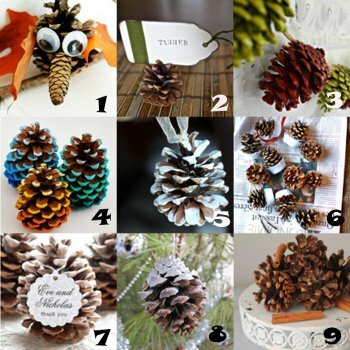 You can forget the typical holiday decor with these contemporary Pine Cone Flowers. 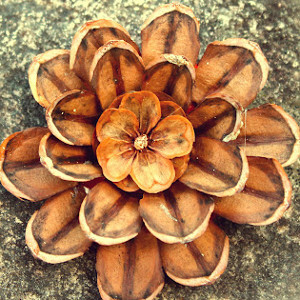 The Pine Cone Flowers serve as a great stand for your place cards. 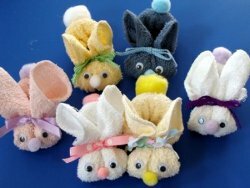 Place them in the center of each person’s plate for a cute fall accent. If you prefer the more traditional, these Custom Chalkboard Place Tags are a great, but still unique, option. The kids will love making these chalkboard tags with you. The fun doesn’t end here. You can also combine your place card with a gift bag. 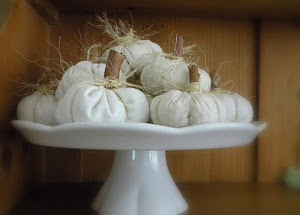 The Thanksgiving Place Card and Favor Bags are an affordable option. I know my guests love this little something extra on the table. 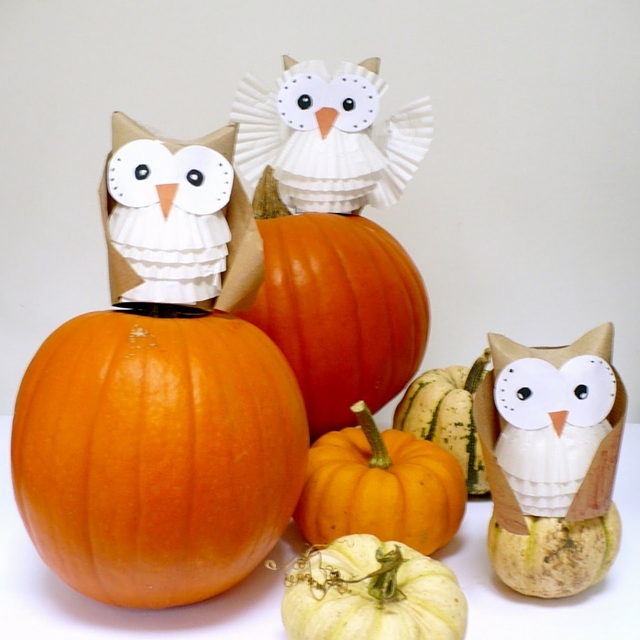 How will you decorate your table this Thanksgiving? 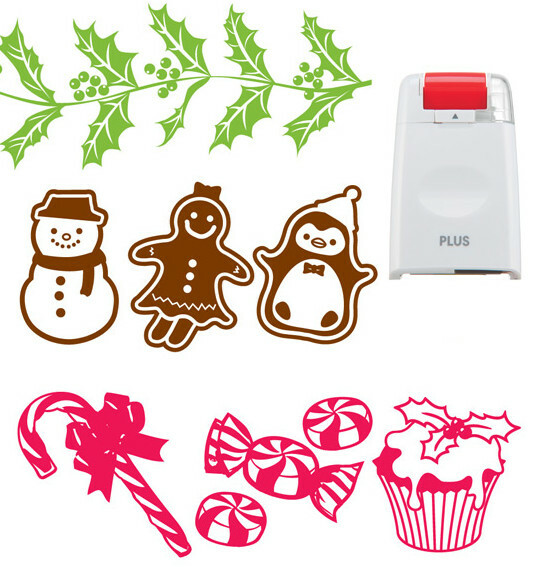 BONUS: Christmas Stamp Rollers Giveaway! 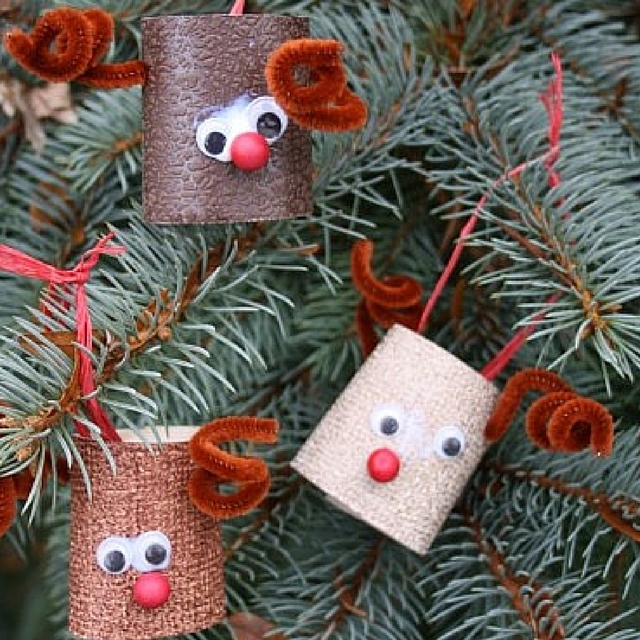 Win a set of Christmas Decoration Rollers! The deadline to enter is November 26, 2013 at 11:59:59 p.m. Eastern Time. With your own set of Christmas Decoration Rollers, you’ll be able to make all the handmade Christmas cards and wrapping papper that your heart desires. You can enter once daily, so return often to improve your chances of winning! 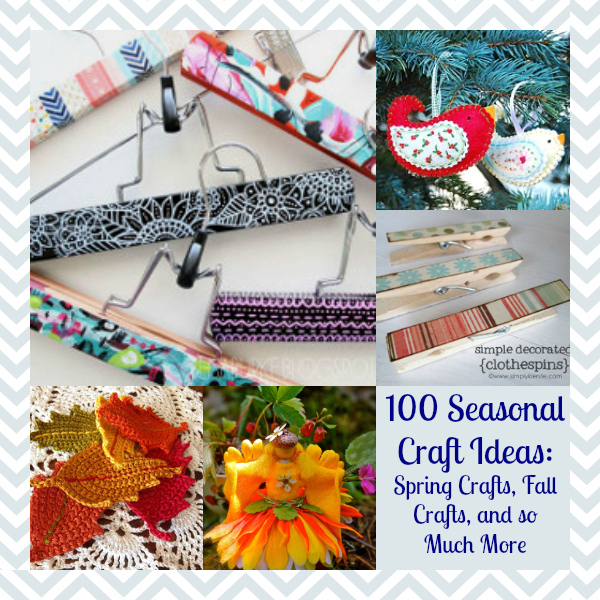 This post is brought to you by Kate Uhry for CraftFoxes. I am very fortunate to live in the Northeast come October. 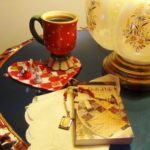 For me, the fall season has its own set of traditions as strong and evocative as flip flops and a glass of lemonade. As temperatures slowly cool, I layer on cashmere, wrap myself in a cardigan, put on fingerless gloves and find my slippers. The teapot goes on the stove, and the Crock Pot comes up from the basement. The farmer’s market goes from corn to pumpkins, and all sorts of random root vegetables appear. Apples fill a bowl on my table, and I start to turn the oven on again. Come join me as I take you through some of the projects I’ll be working on this fall. 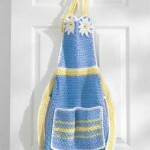 I don’t like to knit in the summer – it seems that even the lightest weight cotton is intolerably sticky and hot. So in early fall, my thoughts turn to Christmas gifts. 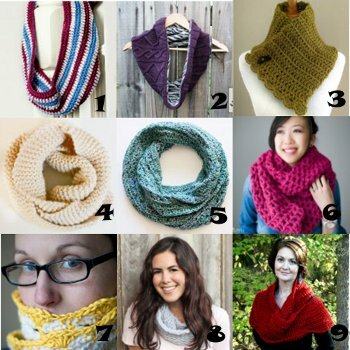 I go around surreptitiously measuring existing sweaters, eyeballing people’s arm lengths, and scouting patterns. Some of the ones I like are a little forgiving. 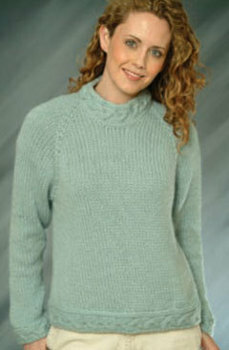 Included in my go-to sweater patterns is a top-down version, which allows you to adjust the fit on the fly. 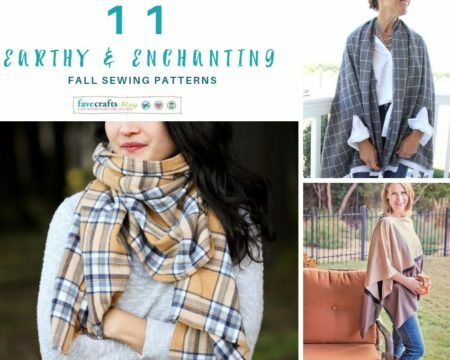 There are also eyelet cardigans, a sweater coat, and a little boy’s sweater, which I promise he will actually wear, as long as you watch the itch factor. For my niece who never seems to be cold, ponchos seem to be the answer. 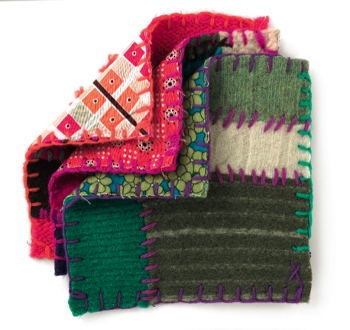 This lightweight layer comes together really quickly, and can add an element of style without being too constricting. 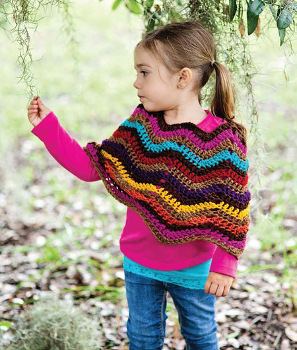 Get the how-to for this chevron crochet poncho pattern. 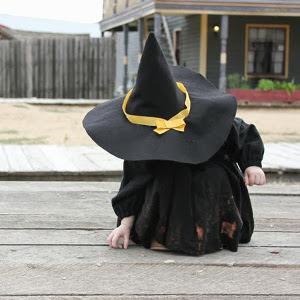 For the babies in my life, I have my eye on a vintage bonnet pattern. It is a simple cap that cradles the head and tucks under the chin. Relatively quick to make but absolutely adorable, I can’t wait to see their little round faces in it come Christmas. As I’m on sitting in the chair knitting, I like to fill the house with good smells. This season, I’m starting with these handheld pumpkin pies. Filled with cinnamon, nutmeg, and ginger, they’d be perfect in the afternoon with a cup of hot chocolate. Oh wait, perhaps I should whip up some mini pecan pies with bourbon? 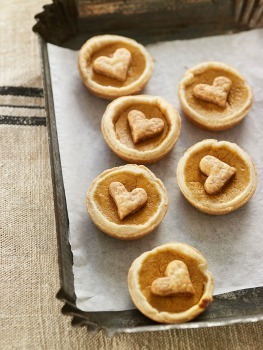 Or sweet potato mini pies with some whipped cream? I can’t decide, so I guess I’ll make them all. I’m recognizing that perhaps I’m not the only one who needs feeding around here. Although there are plenty of acorns for my friends the squirrels, I will also hang this pear and peanut butter bird feeder. 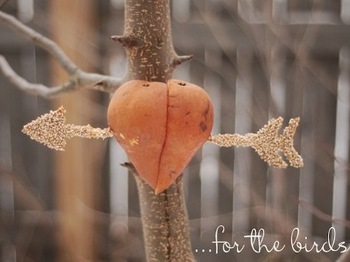 My friend Laura, who blogs at The Wind and Sail, came up with the idea of jamming two pears together to make a heart shape, and then adding an arrow covered in peanut butter and seeds. Seeing it outside in the just bare branches makes me smile. 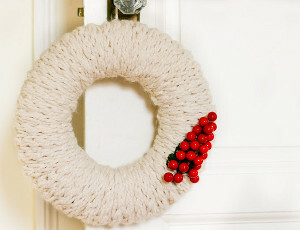 Finally, as the weather indicates that my house is starting the slow slide into closed doors, early nights and warm fires, I’ve got my eye on these recycled sweater pot holders and recycled sweater wreath. 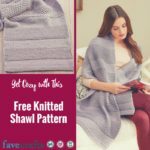 These projects showcase my front door and helps me deal with the fact that I’ve shrunk way too many sweaters. 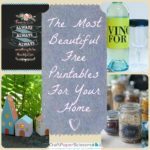 I hope I’ve brought some inspiration to your home. Enjoy the season!